Sally Slick and the Miniature Menace returns us to the world of Young Centurions and to the adventures of Sally Slick and Jet Black, first seen in Sally Slick and the Steel Syndicate. This time around we get right into the action as Sally fumes over being shut out of the local tractor races. With the circus in town, Sally decides to race “unofficially”; of course, Sally leaves everyone else in the dust. After showing up the local bullies and drawing the attention of the circus owner, Sally’s prized tractor goes missing! Author Carrie Harris turns out prose with precision and clarity, aimed at a teen audience with an adult reading level. Her action scenes left me breathless and her description of Sally’s and Jet’s perspective on their adventures plunged me back through time to the days when 100 yards worth of woods around the neighborhood drainage ditch sheltered ninjas and monsters aplenty. Add in a dash of the exotic by having the two of them literally running away to join the circus and this story becomes exactly the kind of adventure I always wanted as a kid. From my current perspective, many years and much hair removed, it’s an adventure well suited to the abilities and station of the characters. It’s only an evening’s read for an adult but I consider it time well spent. “Miniature Menace” deftly sidesteps most of the issues I complained about in “Steel Syndicate”. The opposition is well suited to the characters; even the mysterious bad guys deal with the teens at their own level, and can be effectively fought in that way. My sole complaint of any substance is that Sally and Jet seem to have been shoehorned into this book when it really should have been a Mack Silver adventure. Their motivations for getting involved with the circus are painfully contrived but quickly superseded by Mack’s part in the story. 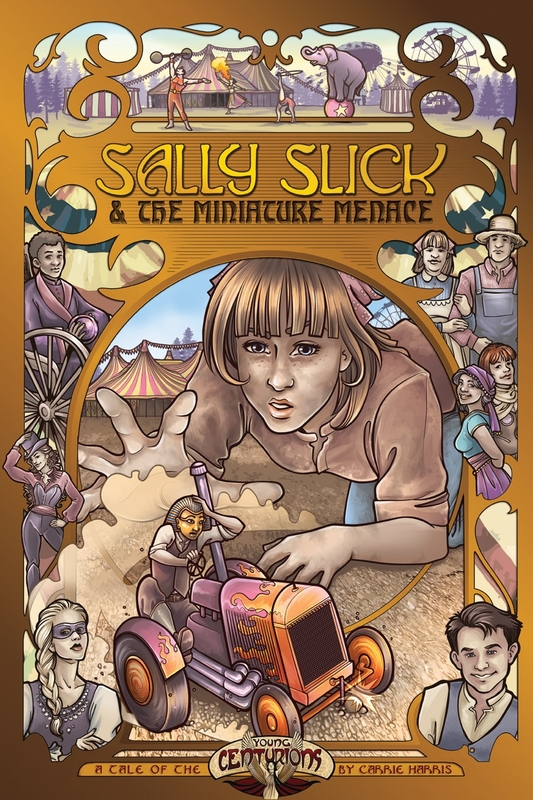 Much is made of Sally’s conflict with the local bullies, who don’t want a girl competing in their tractor racing. 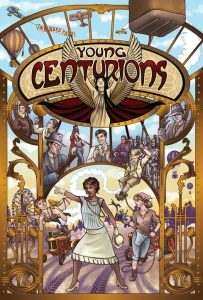 The Young Centurions series attempts to recreate the atmosphere of the 1910s, but both historical records and the literature of the time depict women and teenage girls as starkly independent and broadly capable, especially in the American Midwest. The emphasis placed on her unsuitability as a mechanic and racer because she’s a girl is oddly misplaced for the time period. The idea that the bullies are objecting to her participation because she’s a girl feels awkwardly forced. 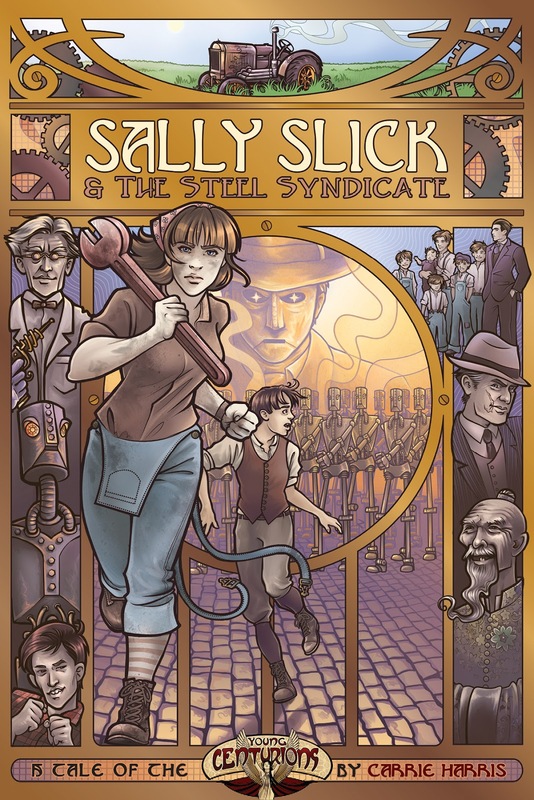 Sally’s mechanical tendencies also create tension between Sally and her father in the early part of the novel, contributing to Sally’s decision to defy her parents and undertake the search for her tractor. Again, I found the basis for the conflict to be awkward and forced, as Midwest farm girls of the era were expected to contribute to the family and run every part of the house. On the other hand, I completely empathize with Mr. Slick’s inability to understand the thoughts and actions of his teenage daughter! It’s a tribute to Harris’ ability to involve me in the story that I felt truly concerned about whether or not Sally would be able to heal her relationship with her father. The denouement scene between father and daughter alone is reason enough to put this book on any parent’s or preteen’s reading list. While it’s also an engaging adventure novel, Sally Slick and the Miniature Menace serves as a superior introduction to the world of Young Centurions. We get introduced to several of the main characters, a circus that provides a natural springboard for adventure, the idea of the Century Club, and a wealth of suitable opposition. The structure of the story breaks down seamlessly into scenes and encounters that form a bang-on model for a game outline. This is so good that I found myself wishing the text of the novel had been incorporated into the Young Centurions RPG book instead of being published separately. The RPG desperately needed something to tie it together, and dropping chapters of the novel in between portions of the RPG text would have a been a perfect fit. As a companion piece it goes from merely a satisfying read to an essential addition to the game book. I really liked this book. It’s a great introduction to Young Centurions, involving far more of the cast than just Sally and Jet. I really don’t feel the title does the story justice, as this is predominantly Mack Silver’s adventure. The threat of the miniature menace seems tacked on as well, but by the time it became a factor I gleefully hand-waved my concerns away in order to keep turning pages. If you are a fan of any of the Spirit of the Century products, pulp fiction in particular, or YA novels in general then I expect you will enjoy this book every bit as much as I did. Evil Hat’s Magic 8-Ball selected me as a reviewer for Sally Slick and the Miniature Menace and provided me with a digital copy of the book. I’m very much afraid that only motivated me to go ahead and pick up the print copy from my FLGS and spend a few bucks on DriveThruRPG to add it to my mobile shelf. When Sally and Jet pick up their next adventure, hopefully exploring yet another corner of the Young Centurions world, I’ll be waiting in the wings. Winston Crutchfield reads far more than is healthy, but is attempting to compensate by foisting his favorite books onto his rebellious teenagers. He’s always open to discussion about books and looking for reading suggestions. He can be found on the Christian Geek Central forums as “MindSpike” or on Goodreads under his own name. Visit a world of pulp action-adventure in the 1910s with the Young Centurions RPG from Evil Hat Productions. If you’re new to Fate or to the Spirit of the Century setting, this book belongs on your shelf. If you’re already familiar with either of those, take a minute to see if this book is going to add value to your collection before you jump on it. In Young Centurions, you take on the role of a unique individual, born in the first minute of the first hour of the first day of the new century. You embody a Spirit of the age, an aspect of the new century that shapes your character with the positive energy of things to come. Shadows oppose you, those people born on the last minute of the last hour of the last day of the previous century, empowered by the energetic detritus of what has gone before. It’s not always easy to separate Spirit from Shadow in the confusion of the new century, even when it seems you’re all working toward the same goals. And oh yes, you’re all teenagers. 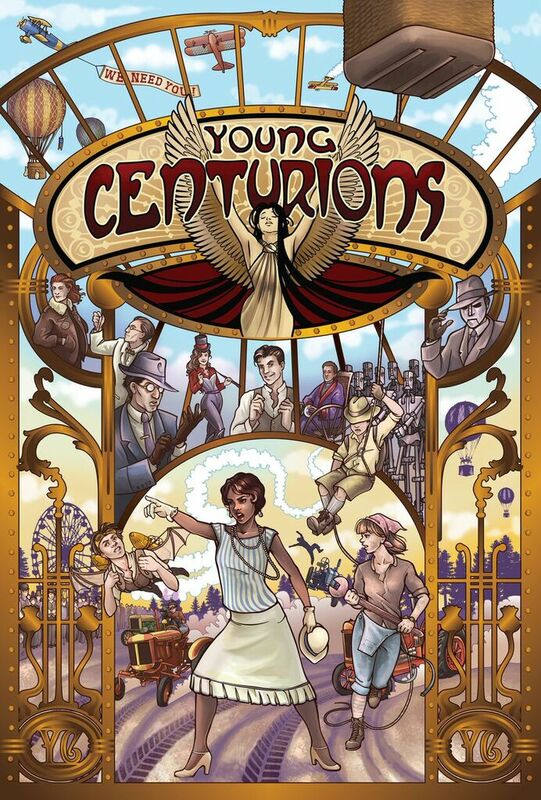 Young Centurions is the prelude to Evil Hat’s Spirit of the Century and Strange Tales of the Century, books that focus on adult characters of the 30s and 40s. Those books use the original Fate or Fate Core rules while Young Centurions uses the Fate Accelerated rules. Characters in Young Centurions tend to be less powerful, less capable, and more vulnerable than adult Centurions, both because the rules of the game provide fewer powers and because, well, you’re all teenagers. That emphasis on the characters as teenagers dealing with unique teenage problems is one of the strongest aspects of the game. (Fate pun…) We’re not talking teen angst here; the responsibilities of teenagers involve personal and family matters far more often than issues of society. Adult heroes make decisions that impact the world at large in ways that shape the events of society as a whole. Teen heroes make decisions that change their family dynamic and potentially jeopardize and hurt the people that matter most in their life. The book does a lot of things right. It provides a set of character archetypes to use as a foundation, with aspect questions and stunt packages that quickly get players into the meat of the game. 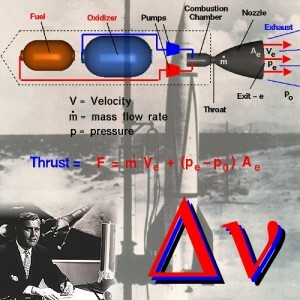 It explains the use of approaches with clarity and through the use of examples. It teases the flavor of the world with story snippets and plot hooks as a springboard for your game. The GM chapter contains solid advice on gaming with teens as both players and characters, as well as tips on how to use the unique elements of the Young Centurions setting. The setting chapter gives us an intriguing glimpse of the world and just what role we’re going to play. Most important, the book makes me want to be a part of this universe. Still, there are things that I wish Evil Hat would have done differently. I see no need to reprint the Fate Accelerated rules, not when they make the FAE book so readily and inexpensively available. Young Centurions does nothing to significantly change the rules; simply adding the setting-specific material would have been sufficient. For all the intrigue generated by the setting teasers, the book leaves us completely cold when it comes to running the foundational elements of the background. The setting has no central conflict around which to build a campaign, though opposing agendas are implied between the Century Club and the Shadows. The book leaves the GM with a great deal of work to do in order to construct a group template, including deciding the specifics of the supporting structure and writing up stats for the opposition. 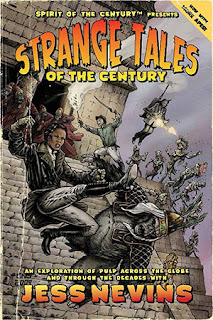 I wanted more details on the Century Club, Doctor Methuselah, and the Steel Don. I want to draw inspiration from that material for my stories; I don’t want to have to create everything from scratch. I find only one critical fault with the book. Young Centurions games follow a story structure rather than a tactical structure, but the book provides no instruction on how to set up a game. This means you can’t simply stock a building with mooks and repeatedly kick down doors. 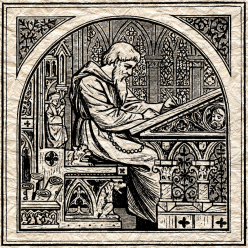 You need to construct your game for narrative flow and problem solving. The Fate Core book includes a whole chapter on how to construct conflict scenes and tie them together. That instruction is absolutely essential to Young Centurions and its absence creates problems for GMs without a strong narrative background. So I’m conflicted. I want to like this book. The premise appeals to me a great deal. It’s a fairly solid introduction to the world of Spirit of the Century. 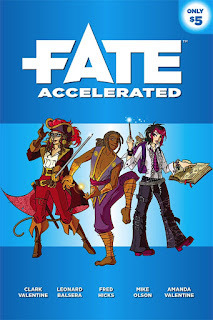 It’s self-contained, since it reprints Fate Acceleratedand does a pretty good job with the rules. It captures the flavor of teen adventure and preserves a spirit of optimism. This is a setting for stories that I really want to read, but it’s also a game that I really don’t want to try to run. Story structure games put up a truckload of work for the GM and require a whole table of players that know how to effectively resolve conflict within a story structure. 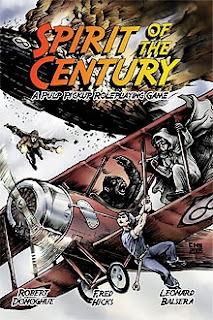 Spirit of the Century at least gives you the option to focus on the action scenes and talk through the rest without detracting from the game play. At the end of the book, I find myself wanting more. I really think there should have been more background material and a chapter on game construction. At only 160 pages, there’s ample room to push the page count up to 198 and create a truly complete product. The price point is good, only $20 for a full-color hardcover – half that for the PDF. It’s a great introduction to Fate and the to Spirit of the Century setting. By the same token, if you’ve already got Spirit of the Century or Strange Tales of the Century this book adds very little to either rules or setting. Even if you’ve already got the Fate rules in one form or another, this book adds some nice new mechanics and just barely enough flavor to make Young Centurions worth the purchase. My copy came from the original Fate Core Kickstarter, though when Evil Hat’s Magic 8-Ball selected me as a Young Centurions reviewer they also provided a digital copy. They have also requested reviews of the two Young Centurions novels: Sally Slick and the Steel Syndicate, and Sally Slick and the Miniature Menace. I read Steel Syndicate back when it was first released and loved it; I’m looking forward to reading it again on my way to the Miniature Menace ARC. See you then! In this episode, we continue training with Goku, Gohan, and Piccolo. We learn the history of the Saiyan race, and Goku masters the fearsome Kai0-Ken. But is it in time to save the Earth? 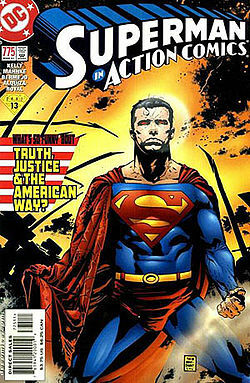 In 2001’s Action Comics #775 , writer Joe Kelly asked the question, “What’s so funny about Truth, Justice, and the American Way?” Kelly was responding in part to a trend in comic books that embraced heroes that took extreme actions towards their villains, often killing or permanently maiming their foes. The violent trend is one part reaction to the “revolving prison door” trope that allows series fiction to reuse villain characters, and one part the emergence into the field of a generation of creators that came of age in the 80s and 90s. 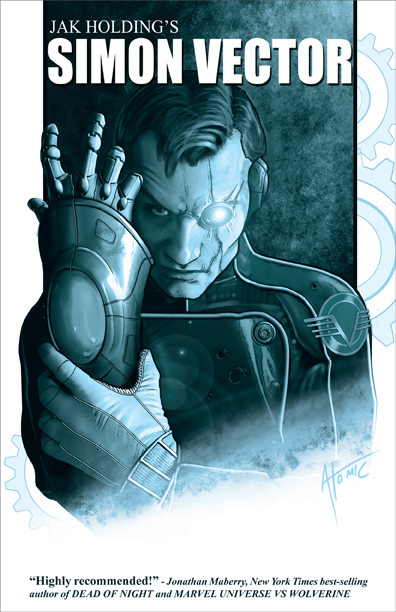 Publishers Dark Horse and Image Comics built their entire businesses around providing consumers with content graphically depicting violence and brutality, and populated by heroes and villains that embraced the narcissistic nihilism of a generation raised with a dominantly post-modern viewpoint that insisted on deconstructing any kind of ethical or moral standard. In this publishing environment, the question of whether a character like Superman could remain relevant, draw in consumer dollars, or even continue to exist in a cultural context was a very real one. Kelly’s response is an emphatic “Yes” that makes the argument, not only can Superman exist in this cultural context, but he must exist in this cultural context if we are ever to move past it toward a future founded on principles other than selfishness. Kelly expressed his point of view in the characters of Manchester Black and the Elite, who embodied the generational values of hedonism, narcissism, nihilism, and entitlement. In combat with Superman, the values that drive the Elite are taken to their logical conclusion, and the effect on society graphically portrayed. Without defending the basis of valuing Truth and Justice, Kelly nonetheless makes an effective argument against post-modern narcissism. The movie is a spiritually faithful adaptation of the comic, not surprising since Kelly wrote the screenplay. The story is fairly simple. The Elite show up and start acting like bullies. Superman puts them in their place. 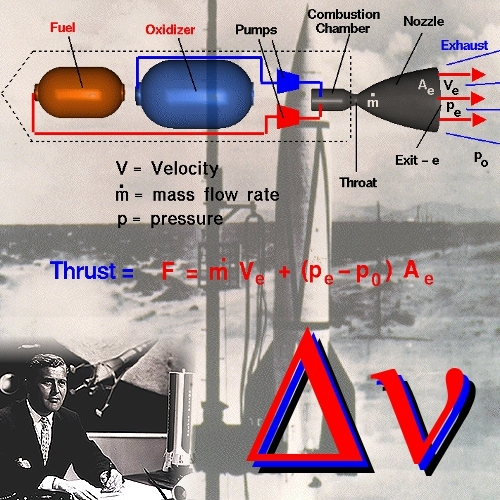 Little time is wasted on complex plotting. The stakes are made clear, and the battle is joined. Story exposition exists solely to allow characters to expound their points of view and provide a logical escalation of tension. Although we really only get to spend time with Superman and Manchester Black, they are the only two characters that really matter in this story. As it is, we get to see not only what it is that drives each of these individuals, but why their motivations are so important to them. Once again, little time is wasted on supporting characters, except how they relate to the principles. Predictably, Superman’s supporting cast is important to him, while the narcissistic Black focuses solely on himself. I expect better from Warner Bros animation. 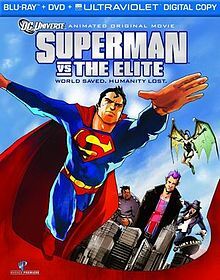 The voice cast is stellar, with George Newbern, Pauley Perrette, and Robin Atkin Downes performing as Superman, Lois, and Manchester Black. Unfortunately, the animation and character designs are distinctly sub-par, with characters feeling oddly angular and anemic. Special mention has to be made of Superman’s chin, which is broad enough to be a super power all its own. The action sequences feel trite and familiar; there are none of the dramatic visuals and powerful sound design we have come to expect from the DC hero movies. The opening and closing credits feel like they’ve been ripped from a particularly jarring 70s acid trip, and the movie opens with a sequence that turns out to be an intentional parody, but whose childish design almost caused me to turn off the rest of the movie without bothering to watch it. Contrast this with the comic book, whose gritty portrayal of the characters, action, and environment sparked the imagination instead of squashing it. This story has some important things to say about humanity, about living in society, about the need for heroes, and about society in general. Thankfully, it just comes out and says them without beating around the bush and making tedious generalizations. Kelly has a drum to beat, and he does so with steadily increasing volume until crescendo. Even though the underlying reasons for the moral imperative are never addressed, Kelly makes a compellingly humanistic argument for the existence and value of the moral imperative. Unfortunately, this story is more fulfilling on paper than on the screen. The comic book is a fantastic read, and Kelly’s other outings with The Elite make excellent storytelling. But the slow pace of the film, the poor animation and character design, and the familiarity of the moral message makes me hesitate to pop this movie in as a random Saturday afternoon pick. Even the feature length commentary and two fascinating featurettes don’t make a compelling case for long-term purchase. The lower investment of the comic book purchase and the extended treatment of the premise make it more tempting to buy the trade paperback, though I find myself just as satisfied with a library loan. After a single trip through the material, I feel I’ve gained all the benefit there is to be had. Ultimately, this is a satisfying movie with an important and compelling message, but as with many cases where stories have been adapted across mediums – the book was better.